Last year I wrote a post about my experience with the Arduino open-source electronics and computing platform. 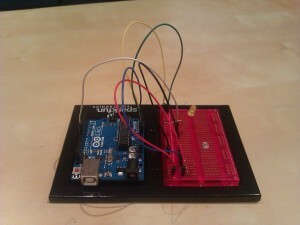 Since I wrote the post, I haven’t really done much with my Arduino. I built a few of the projects in the book that came with the kit, but I haven’t come up with my own creations yet. The makerspace movement in libraries has taken off since I wrote the post last year, and many of them use Arduino as part of their programs, for example Melbourne Library Service, and Duxbury Free Library in Massachusetts. From my limited use of Arduino, I think it is a useful addition to a makerspace. It’s a good introduction to electronics and programming, and the components are relatively cheap to purchase. And being open source means that participants who really get into it can have a play around with the underlying code. Hopefully I’ll be able to post some examples of my Arduino creations for next year’s #blogjune.